When I set out to write the moral, historical and constitutional case for nullification, I knew I had a tough task ahead of me. After all, most Americans have never heard of nullification. And the constitutional and philosophical principles nullification rest on remain alien to even well-educated Americans. My goal in writing Our Last Hope: Rediscovering the Lost Path to Liberty was to expand on the groundbreaking work of Tom Woods in his Book Nullification: How to Resist Federal Tyranny in the 21st Century and make it understandable for the general reader who might not possess a lot of the historical or constitutional context. Plus, I wanted make the journey engaging for the average reader. With that in mind, I included many cultural references and every-day analogies to go along with quotes from the founders and more academic discussions. A recent Facebook posts indicates that I just might have succeeded in my goal! At first I was intimidated by “nullification” and the thought that I was going read a book about something I don’t understand… And I didn’t want to insult you when this whole thing went over my head. 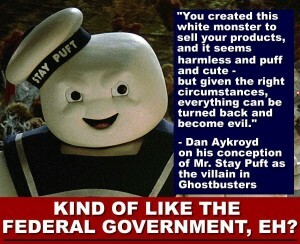 And then you wrote about Ghostbusters and all was right with the world again. ← Constitution 101: Was the Constitution Ratified By States or One American People?